Quality tricolour, good head with turn and fill, wicked eye ,correct mouth, ears bang on top, lovely neck shoulders top line and rear quarters, moved well both ways , well handled and presented. Red and white ,lovely head with turn and fill ,correct mouth, wicked eye, lovely neck shoulders and rear quarters ,bags of bone and substance, also a good spring of rib ,moved well both ways, well handled and presented. Black brindle, lovely head with turn and fill, correct mouth ,wicked eye, lovely neck shoulders and rear quarters ,bags of bone and substance, moved ok both ways, well handled and presented. Quality red and white, lovely head with turn , perfect mouth, wicked eye, ears bang on top, lovely neck shoulders top line and rear quarters, good bone and substance, moved well both ways , well handled and presented. Brindle, lovely head with turn, correct mouth, wicked eye, ears bang on top, lovely neck shoulders and rear quarters , good bone and substance, moved ok both ways, well handled and presented. 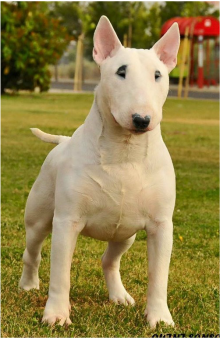 All white, good head , perfect mouth, wicked eye, uses her ears well, lovely neck shoulders and rear quarters, ample bone and substance, moves well at the front a little close behind, in lovely condition, well handled and presented. Quality tricolour, lovely head with turn, perfect mouth, ears bang on top, lovely neck shoulders top line and rear quarters, ample bone, lovely jacket, would like a little more weight on her, moved well both ways, well handled and presented. Black brindle, quality seven year old in beautiful condition ,lovely head with turn, big white teeth with a perfect mouth, wicked eye, lovely neck shoulders and rear quarters, well handled and presented.